Down Syndrome Awareness Day: how far we've come! South Africa is celebrating National Down Syndrome Awareness Day today. Here's a look at all things DS. Down Syndrome South Africa is celebrating this special awareness day to help educate the public, support parents and fight for the rights of those with Down syndrome. Read more about their road to inclusivity. We've compiled a few articles you may find interesting. Curious to know more? Read all about Down syndrome here. One mom whose beautiful boy has Down syndrome (okay, she's my sister and my nephew is just gorgeous) wrote "Avoiding the awkwardness" in which she encourages people to talk to her about her son and his condition. It's okay. Facts and myths about Down syndrome. Above all, it's crucial for us as a society to be inclusive of children with Down syndrome, whether it be at school or in the neighbourhood. Here's a great article to help your child understand the syndrome in a friend or class mate. It's 2016 and children who don't fit the "traditional mould" has finally moved from the inner room to the spotlight! Read what these stars with Down syndrome have achieved, from becoming an actresses to a town councillor. And here we celebrate American actress Jamie Brewer. An interview with the owner of the Brownies and Downies restaurant in Cape Town. And while you still get ignorant people making hurtful remarks, you also get decent people who see children with Down syndrome as any other child (yet recognise the difficulties the parents sometimes face): read how this waiter put unthoughtful patrons in their place! High five to you, sir. 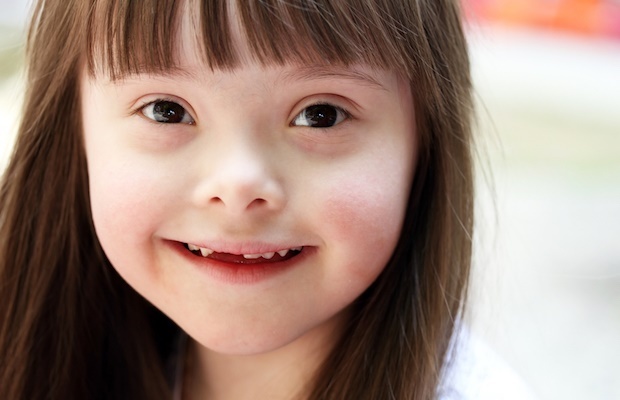 Down syndrome is not an illness or disease, but rather a syndrome: a collection of possible symptoms and conditions that vary from person to person. Here is an article listing some of the health and learning difficulties a child with Down syndrome may (or may not) encounter and how best to deal with it. For interest sake, we've written a bit about various health occurrences, some of which may apply to a child with Down syndrome too, such as flat-head syndrome and polydactyly (born with more than 10 fingers or toes). How flash cards and sign language can help children whose speech development is delayed to communicate, read and write. At school, your child may benefit from a learner facilitator. Learn more about it here. If you're worried about the diagnosis in your unborn baby, watch this amazing video. In fact, just watch it anyway! This little girl talks about her adopted brother (who happens to have Down syndrome). Gorgeous! Watch it. This mother shares her honest story of hearing her child has Down syndrome. Down Syndrome South Africa is a fantastic organisation doing much to raise awareness, remove the stigma, and offer support to parents. Their website is a treasure trove of information. Have a story to share? Please email chatback@parent24.com for possible publication.